Metropolitan from 1687 to 1688A.D. 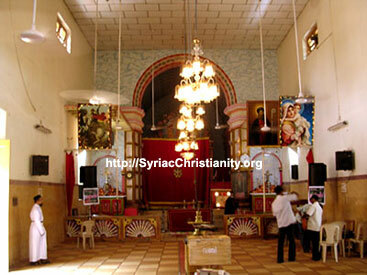 Mor Thoma-III who belonged to the Pakalomattom family was the third known Indian bishop of the Malankara Jacobite Syrian Orthodox Church. 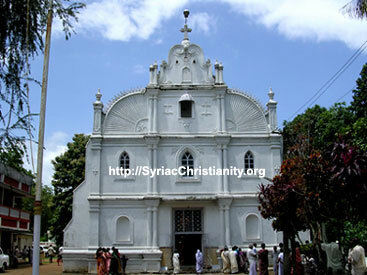 He was consecrated Metropolitan by the Patriarchal representative Mor Ivanios Hidayatulla in 1687 (1686 ?). It was Mor Ivanios who earlier ordained him, as Deacon, Priest and Ramban. 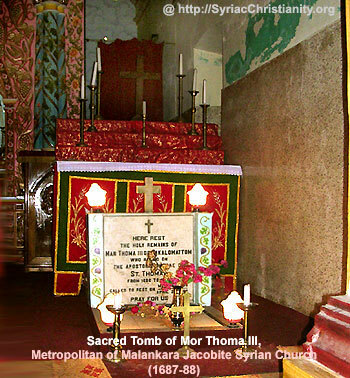 As the Metropolitan of Malankara, Mor Thoma III could lead the church for only a very short period; he passed away at a young age, on 19 April 1688 (M.E.- Medam 9, 863) and was entombed at the St. Thomas church in Kadambanad, South Kerala. 2. Photos taken in August 2004.